The Fourth of July is just around the corner and with all the fun and festivities approaching, we also have to remember that this holiday can be a stressful time for your pets. This holiday has the highest amount of run away and missing animal cases than any other day of the year. Here are a few tips to help ease your pet’s firework anxiety and keep them safe from harms way. 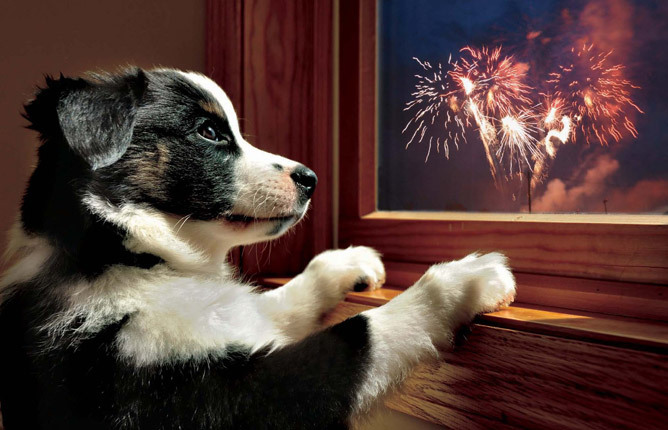 Provide your pet with a safe room in the house during fireworks. Keep a T.V. or radio on (at normal levels) to help tune out the loud noises from outside. Invest in a Thundershirt. Thundershirts have been proven to help relieve dogs of anxiety. Speak with your Veterinarian. Medication can be prescribed to help relieve your dog of anxiety during the holiday. Make sure your pet has a collar with your contact information just in case. It is always a good idea to have your pet microchipped and/or update your pet’s microchip. If your pet is lost contact your local animal control office and surrounding animal shelters immediately. Do not punish your dog for being frightened by the loud noises from the fireworks. Do not force your dogs to be around fireworks. This may cause aggressive behavior. Keep your pets safely away from fireworks, especially as they are lit. Some dogs have been known to try and attack the fireworks.